In our family, Valentines are all about doilies. And that is how it was when I was growing up. My mother was a stay-at-home mom, but had been an elementary school teacher. During holidays she brought out her supplies and decorations from her teaching days. Valentines always involved doilies, and red and pink construction paper. This year, when I asked my 7 year old boy what kind of Valentines he would like to give out, I was fully expecting him to say “Star Wars!” or “Pokemon!”. But no, his answer was “Doilies Mom! Get doilies!” And so I did. After some searching I found nice quality doilies at a kitchen/restaurant supply store. We used a 6 inch size (made by Hoffmaster). To the usual red and pink construction paper hearts my son added some red watercolor paint, stickers, and marker drawings. He went to town on these and each one is unique. Even my 4 year old enjoyed making them for her preschool class. 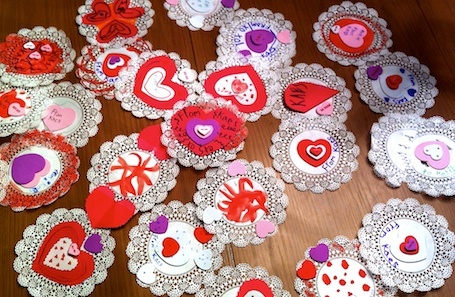 Between the two children, we are handing out just over 50 of these handmade Valentines this year. I think I have found my Valentine’s Day inspiration for 2013! I love these beautiful doilies they remind me of snowflakes and I – for one – would be happy to receive them. They are also the perfect answer to the non-candy valentine, as requested by many teachers. I have to say, I am coming around to this idea. By 11:30 today, the nurse’s office called to say that my daughter had vomited and asked me to pick her up. Worried that she had the stomach flu, I rushed to the school. She seemed fine, no fever. On the way out the door, she told me they were making necklaces out of fruit loops and she ate them all. Then puked. Nice. Aside from our school valentine making frenzy, I managed to make some little gifts for the girls to wear to school. Inspired by this post at Felt So Cute, I took some leftover felt and stitched up some hearts. For my oldest daughter, I made a headband. 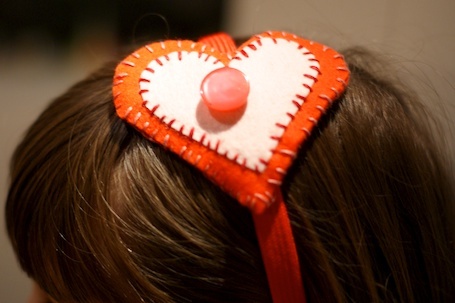 And for my hair-ornament-eschewing 5-year old, I made a pin that got lost in the candy-overdose frenzy. It took about 2 hours to finish them both, but that’s because I was using the wrong needles. This is a completely doable project. So that is Valentine’s Day. The girls are asleep and my husband is making lamb chops. All is well. This entry was posted on February 14, 2012, 10:12 pm and is filed under inspiration, kids, make. You can follow any responses to this entry through RSS 2.0. You can leave a response, or trackback from your own site.